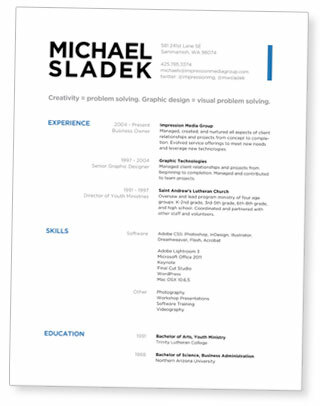 I recently created a resumé design that my wife and son used in recent job searches. They both found jobs. Coincidence? Here’s how it works: just email (michaels@impressionmediagroup.com) a text file (Word, etc…) with the text of the resumé, and I will put that data into my Better Looking Resume™ template and return a PDF for you to share with your future employer. It’s just that quick and easy folks! Some details: The Great Resumé Giveaway ends on June 30, 2011. Please allow 2-3 days for completion of your Better Looking Resumé.